Make your last galette of the month a great one. This recipe is the closest to Nutella I will ever want to get! Irresistible. Melt the butter and chocolate on low heat – do not burn! Mix the sugar and almond powder. Ground or crush the hazelnuts and add that in. You can inverse the ratio so it tastes closer to Nutella. Beat the eggs until light and creamy and add slowly to the mix. Add the butter mix and the rum and vanilla extract. Roll out the pastry. Ideally, the pastry and your hands are cold. This is important when working with any pastry but with puff it is essential: the quicker you work the better for a raised and light result. I always work on marble which makes it easier to keep everything cold while rolling out the thinnest pastry. Cut out a large circle and then a second one but slightly bigger. Lay the first circle on a floured oven tray. Put the filling in the centre and spread it to about a good inch from the sides. Do not forget to place two “fèves” in the mix. Lay the second circle over and fold the sides over it. Push the tip of a fork all around the edge to seal! Decorate with light knife marks and brush over with an egg yolk. Put in the midle of a warm oven for 30mn (200°). Eat hot with a mug of cold cider. 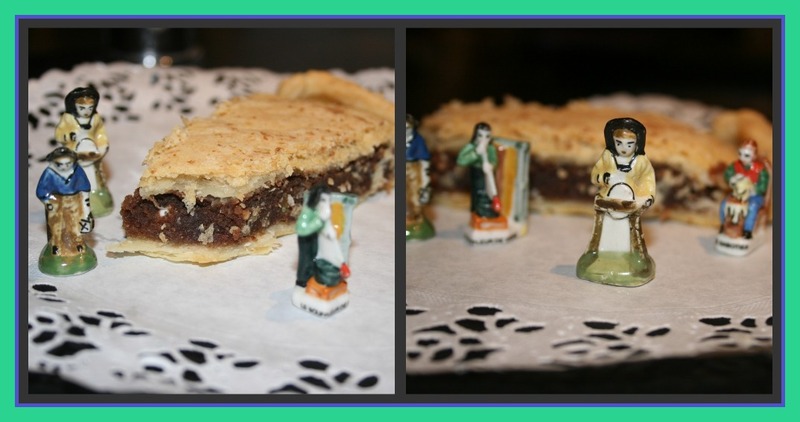 You don’t have to put a charm into it if you are not celebrating the Epiphany and you can eat it any time of the year – in which case it is called a pithiviers. My collection of old fashioned charms inspired me to take some shots very reminiscent of a great book I found recently : “Little people in the city”, street art by Slinkachu. See for yourselves! 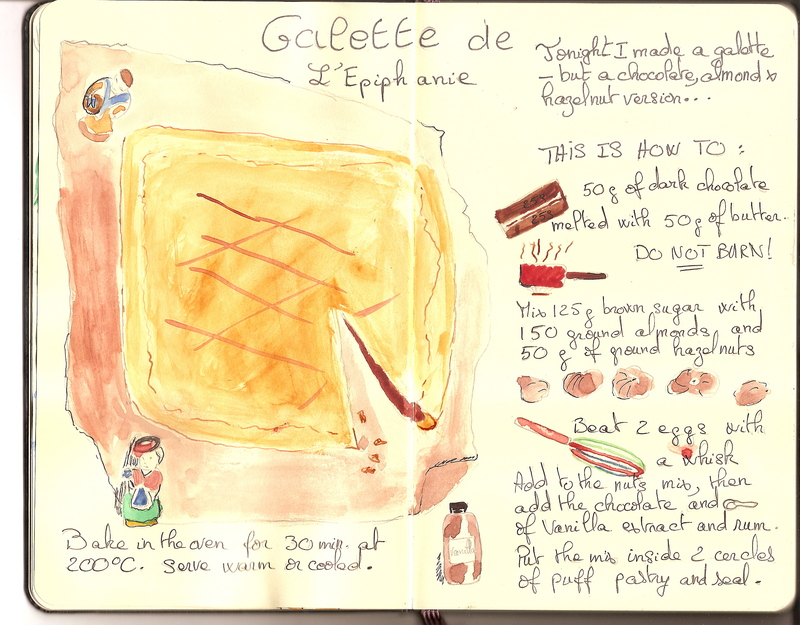 This entry was posted in baking, family favourite and tagged almond, baking, chocolate, galette, illustration. Bookmark the permalink. Voilà une recette bien gourmande.